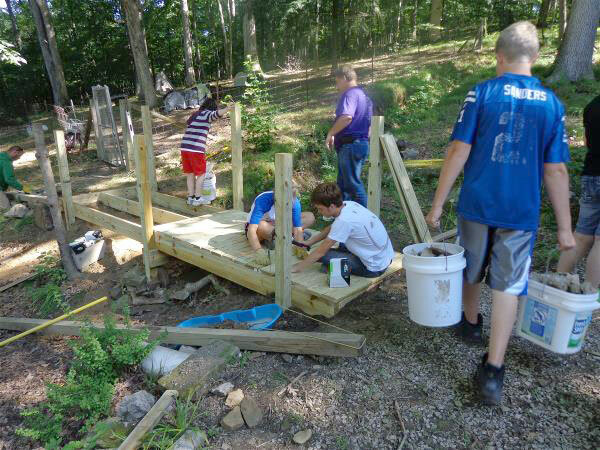 BROWN COUNTY—Each summer, teenagers from St. Agnes Parish in Nashville, and St. Benedict and Sacred Heart of Jesus parishes in Terre Haute, come together with adult leaders to help people in need in Brown County. Indiana Nazareth Farm is a service camp sponsored by St. Agnes and the Terre Haute parishes. It is based on four cornerstones—community, prayer, simplicity and service. This year, the camp took place on July 26-30, and included 17 teenagers, eight young adults and eight adults. Each teenager and adult leader provided an average of 36 hours of intensive hard labor in just four days, equaling 1,188 hours of volunteer service. Team leaders were youth ministry coordinator Adrianne Spahr of St. Agnes Parish and Janet Roth, youth ministry leader for the two Terre Haute parishes. As in years past, the youths and their leaders reached out to the Brown County community, and provided their spiritual and physical strength to enrich the lives of residents and ease their day-to-day challenges. Some of the projects included painting inside and outside of homes; building a three-section compost bin; cleaning gutters; yard work and clean up; splitting, moving and stacking wood; building a bridge over a ravine; clearing debris from storm damage; building a raised flower bed; building a bed frame and washing more than 90 windows at one house. In addition, the youths and leaders shared prayers and reflections each day. The original Nazareth Farm was formed as an association of the Catholic Church and is located in the Diocese of Wheeling-Charleston in West Virginia. Its purpose is to provide volunteer service to the people of Appalachia. In 1994, the program was started in Brown County by Benedictine Sister Mildred Wannemuehler, then-parish life coordinator at St. Agnes Parish; youth ministry coordinator Roth at the Terre Haute parishes; and Mike Lewis, then-youth ministry coordinator at St. Agnes Parish. Dee and Gene Suding have been instrumental in the ongoing success of the project, providing space for the camp and continuing support of the mission. “The appreciation of the people served by these outstanding youth and adult leaders is impressive and heartfelt,” said Carol D. Nathan, publicity coordinator for Indiana Nazareth Farm. The Nazareth Farm project is held each summer at the end of July.